One of the key aspects of safe travel is wearing a money belt. But how do you access the money in the money belt? The answer is… you don’t. NEVER EVER. At least, not in public. Instead, you use money you’ve placed in your travel wallet. The travel wallet is also known as the dummy wallet. It acts as a decoy to the money belt. The money belt is worn on your body, under your clothes. It keeps your travel documents, credit cards, and cash. It is NEVER accessed in public. The travel wallet, on the other hand, keeps the small amount of money you’ll be using for the day. It has the money that comes out in public. It is the thing that thieves will target if they want to steal from you. If you are a target of theft, you’ll only lose a day’s worth of money, not the entire amount. My travel wallet is a small change purse. I bought it at one of those accessory stores that cater to teenage girls. It has two pockets. I use the credit card size pocket for my cash. There is a second pocket for change. The change purse is small enough to fit in my pocket, so I don’t have to carry a purse. That makes it harder for thieves to steal – they actually have to go into my pocket to get my money. The wallet is made out of corduroy, which makes it slightly sticky. That makes it harder for a thief to slip it out of my pocket. The wallet also has a small ring attached to it. I can clip the wallet to a key ring holder to make it even more secure. I went a step further and modified my travel clothing. 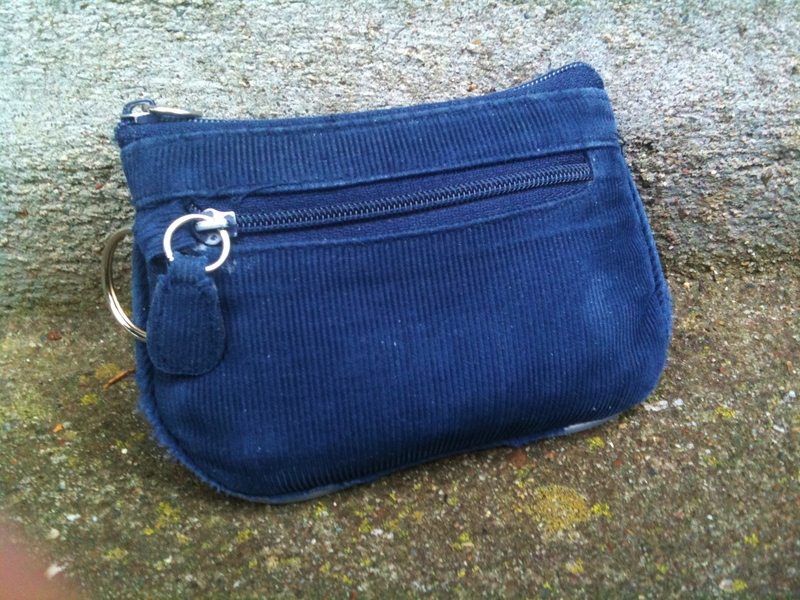 I sewed small wallet tethers inside the innermost zippered pockets of my garments. Each tether is a short length of hem tape that I bought at a sewing store. I attached a small clasp to the end of the tether. I then clip my travel wallet to the end of the tether. The tether is long enough so I can pull the wallet out of my pocket if I need to get access to it. 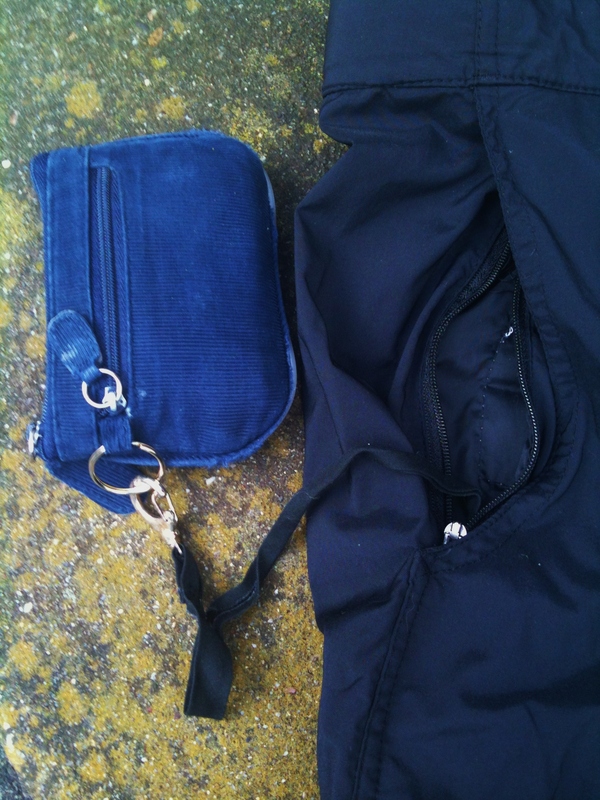 A wallet tether sewn into an inner pocket makes theft difficult. You can maximize your safety during travel by making yourself less of a target. Keeping your money hidden is a key aspect of that. The travel wallet offers a very small and light method of carrying money. It also gives you the freedom of travelling without a purse if you chose to do so. And isn’t light travel always about freedom? How long is the tether exactly. I want to make some of these as I sew. It really depends on your preferences. I use around 8-12″ or so. It should be long enough to pull it out and get money but not so long that it would get knotted or tangled. If you are worried cut the longer length and sew the base into the pocket. Then loop the other end through the wallet ring and find the length that works.